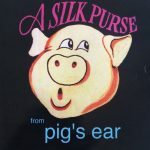 We are excited to be bringing Pig’s Ear’s folk music to a wider audience with downloads now available on bandcamp.com. It’s ‘pay as you feel’ and all proceeds from sales go back into the Grant Rule Trust. The album ‘A Silk Purse’ is now available to download alongside their Christmas album ‘A Cracklin’ Good Christmas’. Silk Purse is also the name of the spin-off duo formed by Sue and Lyndsey Rule who still perform in pubs, clubs, bars and community events across the UK.